Opinion: Just when you thought the NFL couldn’t fall any lower after last fall, they hit rock bottom and began to dig. The NFL has passed a new policy about the entire standing for the national anthem, and now players will have the choice to either stand for the national anthem or remain in the locker room. 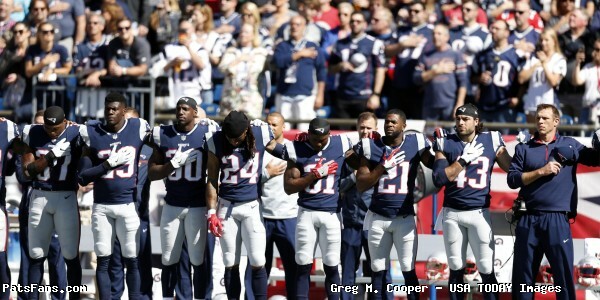 If players on the field don’t stand for the national anthem, the teams not the players will be fined. This move is in direct response to the Colin Kaepernick protest. Kaepernick began protesting the treatment of young men of color by the police and began kneeling during the national anthem. This began in the 2016 season and soon other players took up the cause as well. Regardless of how silly Kaepernick looked showing up to a press conference wearing a shirt of the biggest mass murderer and oppressor of people of color in the Western Hemisphere, there was a huge undercurrent of support, especially among the African-American players of the NFL. Many have been told that they’ve abandoned their roots and have lost touch with their own people. Other players have experienced what Kaepernick was protesting first hand. The protesting reached a peak during Week 3 of the 2017 season. It remained a hot topic for about the next month and gradually faded away. Why the NFL decided that this issue needed to be decided this spring was foolhardy at best. And let me say …again, I was against the protest, because of the manner in which they conducted it. It struck a nerve inside myself as a military person as it did many of the other veterans who’ve turned their backs on the NFL because of it. I hated it. But the freedom of speech is one of the things we defend for the people of this country. I haven’t walked in any of those men’s shoes. If they truly feel that those issues are a problem, it isn’t up to us to dismiss them but to fix them. I thought there was a better way to protest, however, that opportunity is lost now. I wrote about it here: So, while I may have disagreed with the manner of the protest, I fully supported the idea that the players could protest. As a veteran, the flag to me represents the beacon of freedom that most of the world, who rushed here to become part of our nation, had never known. It also gives you the right to peacefully protest perceived wrongs without the fear of retribution. That is what soldiers defend every day. The prevailing attitude among many of the fans was that the players were unpatriotic, were disrespecting the military and the flag. Nothing was further from the truth. And in coming to their “compromise”, the NFL and the league owners decided the outcome for everyone. And their method is completely un-American. The compromise was made between the league and the owners where the players were not even consulted. If that isn’t a slap in the face to the NFL Players Association I don’t know what is. They knew this entire thing stunk so badly that they didn’t even take an official vote on it. They took an informal consensus among the owners. This shows what a disconnected, fractured relationship the league has with its main employees. They’ve effectively decided that they can give or take away the players First Amendment rights. In the end, the league voted with its wallets. Several sponsors have discussed their discomfort with the fan bases pushing back against the player protests and don’t forget the league’s “Salute to Service” that they pushed back in the 2015 season wasn’t done for free. The Department of Defense paid heavily for those ads. That isn’t a brave act or even a smart one. It was a cowardly act that showed that the league and owners are hoping that if they ignore a problem it doesn’t exist. During my many years in the military, I served with men and women from all walks of life and every conceivable background one can imagine. America is a true melting pot. The NFL is different. The NFL is predominantly made up of African-American young men. And many of them don’t feel they get treated the same way other citizens do. Unless you’ve walked in their shoes, then we can’t tell them their feelings are wrong. The First Amendment is more than just words on a piece of paper. It is one of the cornerstones of what our country is founded upon. That’s what our veterans fought for and continue to fight for today. Of all weeks for the NFL to come up with this fiasco, on the week we celebrate the veterans who made the ultimate sacrifice in the service to this country, it is ludicrous. For a league that wraps itself around the flag and the military every week, they should have known better. They could have easily let the issue alone and it would have been minor at worst this season. 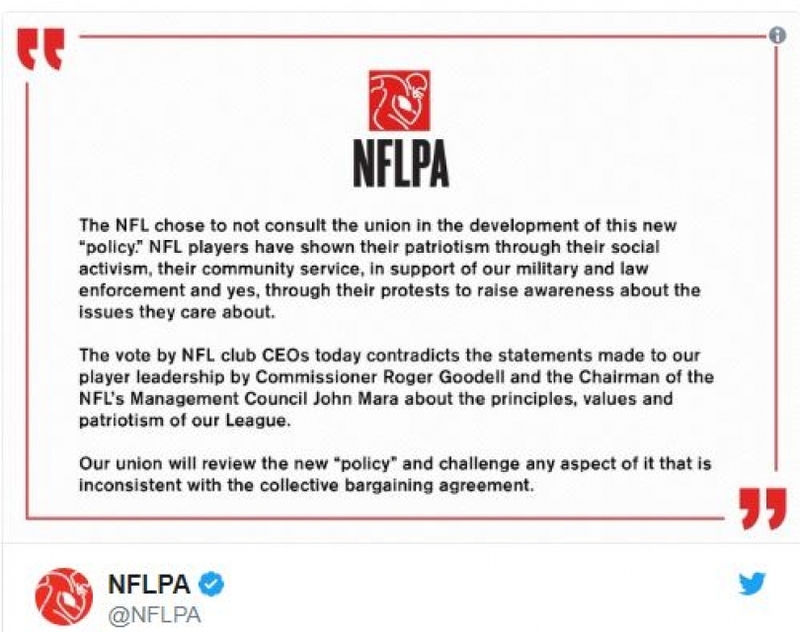 They could have opened a dialogue with the players to see what the two sides can work out while not stomping on the players First Amendment rights. But they chose Door #3, and arbitrarily decided what rights the players have or don’t have. And that path is wrong, it is un-American and the league, not the players disrespects what the flag and the veterans represent. This entry was posted in 2018 Patriots Offseason, NFL Commentary, NFL News, Patriots Commentary, Patriots News and tagged 2016 NFL Season, 2017 Patriots Season, 2018 NFL Season, 2018 Patriots offseason, Colin Kaepernick, New England Patriots, NFL, Patriots, players kneeling, protests, Roger Goodell on May 25, 2018 by Steve Balestrieri.